Down Goes Brown: Take the Quiz: Penalty or dive? Take the Quiz: Penalty or dive? motivational "Drive For a Championship"
dressing room mural was missing a letter. This year's postseason is quickly turning into the Year of the Dive. While occasional "embellishment" has always been a hockey fact of life, this year's playoffs have seen players, coaches and media complaining that certain opponents are taking the dramatics too far. The problem has become so noticeable that the NHL reportedly issued a directive to officials to call more diving penalties. But that move appears to have just created more controversy. On Saturday, Lightning forward Steve Downie was even given a diving penalty on a hit from behind that left him injured and unable to return to the game. It's all very frustrating. Short of using lie detector tests or hiring a mind reader, how can a fan really tell whether a player was diving? A player has hit the ice clutching his head after a borderline penalty. Which of the following would make you suspect a dive? a.) The replay doesn't show any significant contact to an area that would normally cause a player to grab his head, such as a typical player's face or Joe Thornton's ankle. b.) The player reacts to the "head injury" in a way that no other player ever does, such as actually going to the NHL-mandated quiet room. c.) The team's media guide mentions that the player's off-season training partners are Peter Forsberg, Sean Avery and Marcel Marceau. d.) The borderline penalty he was reacting to was a delay of game call for shooting the puck over the glass. a.) Visibly shaken by the impact. b.) Wiping away what appears to be blood. c.) Wiping away what appears to be blood, while holding a handful of empty ketchup packets. d.) Nonchalantly performing his own root canal on the bench in between shifts (Martin St. Louis only). a.) The sound of a devastating impact that could not have been faked. b.) The crowd murmuring in confusion over whether they'd witnessed a dive. c.) The player's teammate banging a clapperboard while yelling "… and, action!" d.) The player yelling "NOOO" as he dramatically falls to the ice in slow-motion, which is odd since the replay was at regular speed. a.) He told the referee he was, and hockey players just don't lie about stuff like that. b.) You're not sure how he would have got the ambulance driver and all the EMTs to play along like that. c.) The dive was predicted by hundreds of billboards purchased by Harold Camping followers. d.) He's one of those weird guys who insists on playing the game as if he has actual dignity and self-respect. a.) The incident did not seem significant enough to warrant that much of a reaction. b.) Carcillo has a reputation for occasionally embellishing in attempt to draw calls. c.) The other player immediately protested that he had barely touched him. d.) Carcillo's team was eliminated from the playoffs weeks ago, he's currently watching the game next to you in a bar 500 miles away, and he just dusted himself off and explained "Sorry, force of habit." a.) His attempt to make eye contact with the referee first. b.) His use of his hands to brace himself for a fall. c.) His old mattress that he dragged out onto the ice for a softer landing. You now have enough information to be convinced beyond any doubt whether you've witnessed a dive or not. Feel free to get on Twitter and start berating people about it. The Joe Thornton crack and the Canucks jersey crack were the best. Again, thanks for the mid-morning laugh. "Sorry, force of habit" HAHA. Best quiz ever. Amendment to the embellishment rule: "Trust falls" are permissible, provided your last name is Subban. What about an evaluation from Dr. Mark Recchi? Hey, Martin St Louis isn't the only amateur dentist. I recall one Eric Belanger removing a tooth rather non-chalantly. Seriously, I wince more when I pop zits in my parents basement. Suppose he falls to the ice in slow-motion WHILE wearing a Canucks jersey. Should he get a double-minor for diving? You can spot a Sharks player diving quite easily, they give themselves away by accusing the opposition of diving beforehand. Another key indicator is the area the Sharks player clutches as he falls to the ice, more often then not they instinctively grab their throats in response to a familiar choking sensation. Jack Edwards simply penciled a little "H" inside all of the C answers. The funny thing about Carcillo, is that his embellishment seems almost like an absurdist commentary on how much opponents can get away with. Against Buffalo, he was repeatedly punched in the face after almost every play, and his head snaps got more and more dramatic every time it wasn't whislted. Here's a hint if you want to be funny in DGB's comment section. Throwing angry barbs about your favorite teams in the format of "HEY YOU FORGOT TO SAY THAT THIS GUY I HATE ON ANOTHER TEAM GETS NOTHING EVER" (ie, Subban comment by Anonymous): not funny in the slightest. Subtle Jack Edwards CH joke: funny. One makes you look like a mongoloid with no capability of an unbiased viewpoint, the other makes you look like a clever hockey fan. How to spot a 'Diver'....Stevie Yzerman has taken the sport up again or all those up and coming stars that list Stevie as a hero are mimicking their idol. 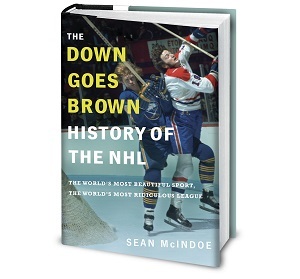 The second greatest accomplishment Scotty Bowman had as a coach was getting Stevie "Diverman" to stop diving. Thank you Scotty! "c.) The team's media guide mentions that the player's off-season training partners are Peter Forsberg, Sean Avery and Marcel Marceau." Get some kleenex already, those acid tears will tear up your #99 Wayne Gretzky-with-St. Louis jersey. You sound bitter about Stevie Y. Hmm. I wonder why.